The Survivor Fixed Blade Outdoor Knife (model HK-106320) features a black tanto blade and a 2-tone green cord-wrapped handle, with a 7-inch overall length. Ideal for camping expeditions and survival training, this Survivor full tang knife features a 3-inch, 4mm black stainless steel tanto blade. The cord wrapped handle gives you superior grip in even the wettest of conditions, while also providing easily unwrapped cordage when needed in a pinch. The included magnesium alloy fire starter enables you to effortlessly start a fire in no time. This knife comes complete with a nylon sheath for easy and safe carry. 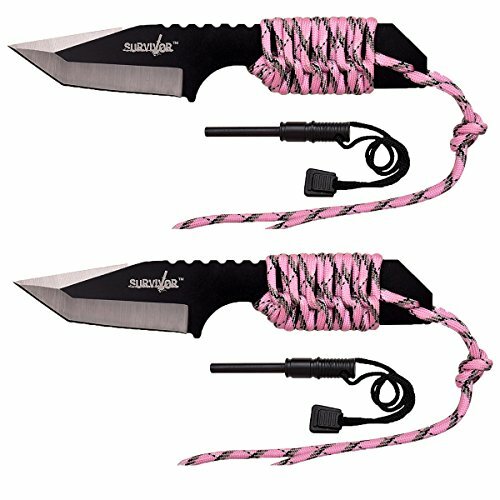 Geared toward outdoor activity, Survivor offers a wide variety of classic survival knives and rugged fixed blade knives.